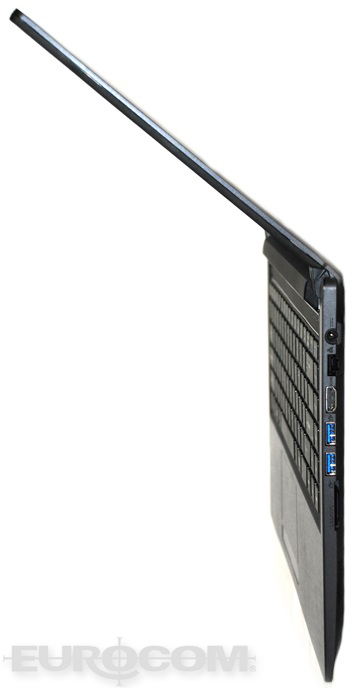 Eurocom is launching the thin, light and multi-touch enabled 14” Armadillo Ultrabook notebook. The beautiful 14” FHD 1920x1080, 10 point multi-touch display will take your breath away and allow users to interact with their little Armadillo like never before. With the convenience of a tablet and the capability of a laptop, the 14” EUROOCM Armadillo is built for the new age of power user. Maximize your Windows 8 experience with multi-touch technology to swipe, scroll and select with intuitive gestures. “The EUROCOM Armadillo is a perfect complement to our line of thin and light notebooks from 11.6” to 15.6” as it focuses on the pleasure of computing combined with a beautiful 14” design. The EUROCOM Armadillo has the power, speed and slim build that can’t help but turn heads, who knew an Armadillo could be so beautiful!” Mark Bialic, Eurocom President. Weighing just two kilograms and being 22 mm thin makes the EUROCOM Armadillo extremely easy to carry anywhere, with no need for a power cord due to 9 hours of battery life. A sleek brushed metal exterior is fashioned after the rough exterior of the tough, rugged little Armadillo for a heavy duty mechanical design for on the go computing. The EUROCOM Armadillo support two storage drives for up to 1.4 TB of storage by combining a standard storage drive with an mSATA Solid State Drive. Up to 16 GB of DDR3-1600 memory is supported via two sockets, providing the Armadillo with ample memory to accompany the ultra low voltage Intel Core i7-4500U processor and Intel HD Graphics 4400, the Armadillo allows you to travel light while providing the performance you need for what you do.